Things are looking up for 23andMe. Right off a fresh $115 million cash infusion, the Food and Drug Administration is giving the direct-to-consumer DNA company the green light to include health and carrier status, along with ancestry reports. This was not the scenario two years ago when the FDA put a moratorium on 23andMe’s ability to provide any health information associated with its personal genome test. “The Food and Drug Administration (FDA) is sending you this letter because you are marketing the 23andMe Saliva Collection Kit and Personal Genome Service (PGS) without marketing clearance or approval in violation of the Federal Food, Drug and Cosmetic Act (the FD&C Act). Some might draw the similarities between Theranos’ current FDA struggle and 23andMe. The blood test startup valued at more than $9 billion and backed by the likes of Henry Kissinger recently came under fire for questions about the accuracy of its test results and the revelation that its proprietary ‘Edison’ machine currently processed only one of its 240 tests. The startup pulled back under regulatory pressure. 23andMe has reportedly worked extensively with the FDA behind the scenes to gain approval, including sending head of the company Anne Wojcicki to D.C. for meetings and hiring a policy director to handle FDA regulatory matters. The FDA added a glimmer of hope to the company earlier this year when it allowed it to test for a genetic carrier disease called Bloom Syndrome, a rare recessive gene disorder characterized by shorter height and a predisposition to develop cancer. Parents of children with Bloom Syndrome don’t exhibit any symptoms of the disorder. The FDA classified the Bloom Syndrome carrier screening tests as class II, meaning the kits were given special controls for the direct-to-consumer market. It seems the FDA is much warmer to more testing using the platform these days. 23andMe can now test for more than 60 health, ancestry, wellness and carrier status reports as well as add new genetic reports and new genetic discoveries to paying customers. AncestryDNA is a similar spit-tube service that offers genetic testing to consumers, but with a focus on ancestral lines and ethnicity. 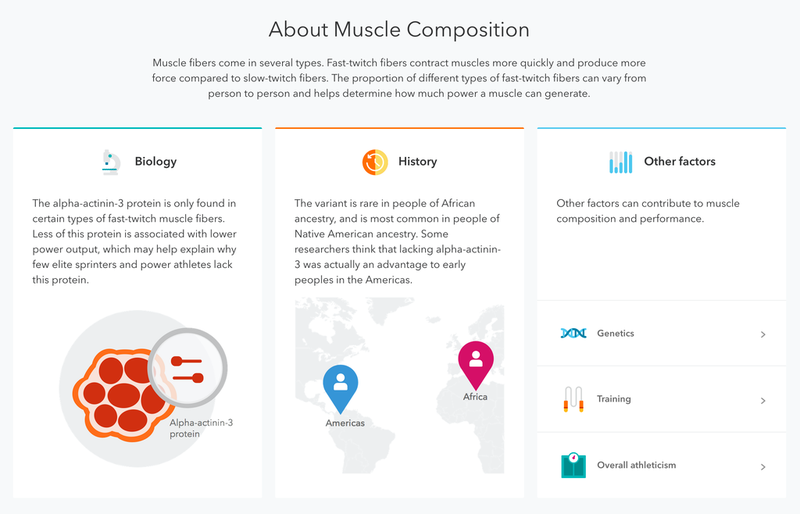 We’ve heard from sources that Ancestry was toying with the idea of adding health information at one point. However, 23andMe is the only service available to consumers with health reports that meet FDA standards at the moment, according to the company. 23andMe redesigned the site to function with the new approvals, too. “The new reports are clean and simple in design and contain detailed, easy to understand information directly influenced by user comprehension studies and extensive design work. 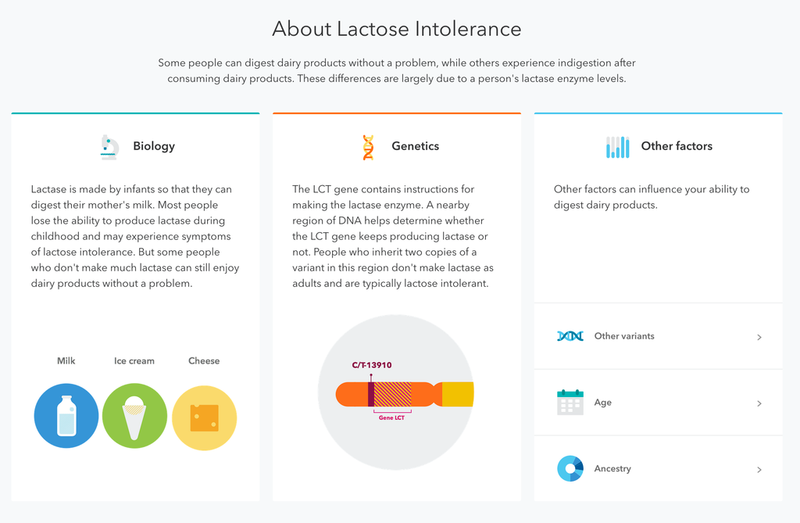 They’re also backed with robust scientific details,” a 23andMe spokesperson told TechCrunch. Some of that new functionality includes the ‘Share and Compare’ feature, allowing you to see all of your family connections in one place and trace variants throughout your family.